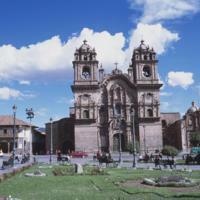 The main Jesuit church in Cuzco, La Compañía, was built atop the ancient palace of the Sapa Inka Wayna Qhapaq. Ninety-nine years after La Compañía was finished in 1668, the Spanish crown would expel the Jesuits from Spanish America in 1767. The 18th century building seen on its right side served as the Jesuit university until their expulsion and still holds a school. Across the street to the left are shops and restaurants. In the colonial period, they were elite palaces and government buildings. Here and throughout Cuzco, pre-Hispanic Inka stonework, which served as the foundation for Spanish colonial structures, still stands. Today, the central square is a park-like plaza, but it served as a marketplace until recently. La Compañía was begun, under the patronage of Jesuits, in the 16th century, yet much of the current structure dates from the 17th century. Cuzco was prone to earthquakes, and many of its colonial structures were rebuilt after 1650, when a horrific tremor hit the city. Like many religious buildings in the former Inka capital, this Catholic structure sought to reclaim, in literal terms, sites of extraordinary political and sacred meaning for Andeans, in part by occupying the same sites. In this case, the plaza visible in front of La Compañía, the Plaza de Armas, was once half of the Wacaypata, the great Inka square, used for all important imperial celebrations. Its original designers seem to have incorporated soil from all parts of the empire, including white sands from the Pacific coast. Fraser, Valerie. “Jesuit Order.” In Grove Dictionary of Art Online. Wethey, Harold E. 1949. 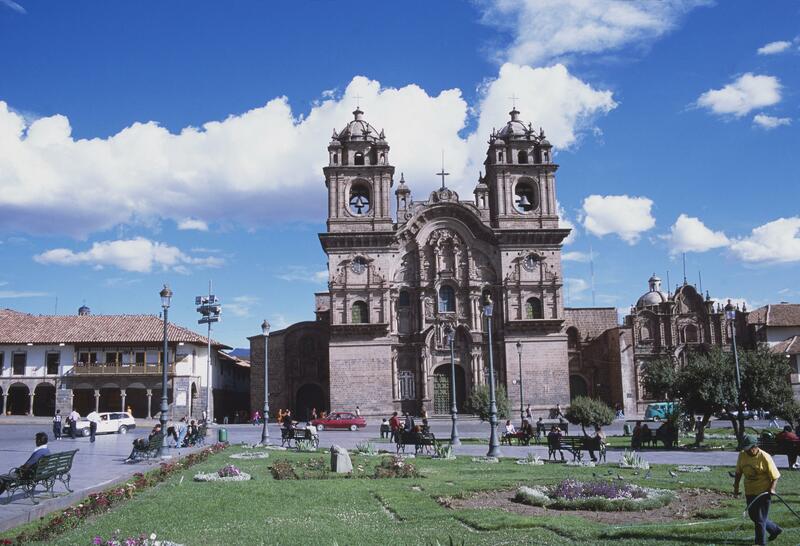 Colonial Architecture and Sculpture in Peru. Cambridge, Massachusetts: Harvard University Press.